Quebec’s bonds have been rallying since Quebec Premier Pauline Marois is downplaying the idea of a potential referendum. Bloomberg has a good article covering the topic: Pimco Says Marois ‘Mess’ Gives Quebec Opportunity. This is good news because at the beginning of the election the combination of a Parti Quebecois majority with an open door on another referendum on Quebec’s future has increased the cost of borrowing in the province. Now, with the backtracking on a potential referendum and a change in the poll has cool down the yield on the bonds. At the moment Quebec has a lower credit rating than Ontario and Alberta (obviously). DBRS rates Quebec A-high with a stable trend. According to data compiled by Bloomberg, Quebec has C$24 billion in debt that matures this year and carries approximately C$210 billion in debt. Already a creditor province, you certainly don’t want a spike in the borrowing cost. Reported in the paper Le Soleil, PM Marois brushed off the potential higher borrowing cost as a joke. She referred it as an “old trick” to scare people. This attitude is the one that making her sink in the polls. The attitude of not tackling the real problems to deviate toward other topics. Not addressing the loss of jobs, the higher debt, and a deterioration of the public finance is catching up to her. It’s these hard issues that needs to be focus on to make the province stronger. Dancing around the identity card with La Charte des Valeurs and a referendum is a way to mask the real problems. If you just loss your job, like many Quebecois did, you don’t want your leader talking about the way people should dress and their religious beliefs. That’s not going to fix your problem and it’s not providing a solution to your next mortgage payment. Why it’s important: Quebec needs to borrow on the open market to finance its deficit. It raise money by issuing bonds. The cost of borrowing is associated to its credit risk and your credit rating provides is an indicator. The lower your credit rating, the higher the cost of borrowing, and the higher the interest debt service. The higher the service on the debt as part of the budget is less money for important things like health care, education, infrastructure, and social programs. This game can work as long as the capital market likes you. Down the road, the creditor might become anxious on the direction of the province and the state of its public finance. What you don’t want is creditors forcing the government to make really bold action such as cutting funding to certain programs and raising taxes. Instead of being in control, the creditors are. And the creditors will do what’s best in their interest to make sure they get paid back, because remember you took money from them. An example of situation is Greece, where foreign creditors (e.g. IMF, Germany) are dictating the public finance. Quebec is not Greece and we are miles away from such a scenario. However, you need to address the problem now and not wait for the problem to address you. Quebec has all the ingredients needed to be a prosperous country: a talented workforce, top-ranked universities, advanced industries, abundant natural resources — everything but the good governance required to bring it to Swiss or Swedish levels of economic competence. One day it will acquire that governance and assert its desire for independence. It’s nice to hear that statement from somebody else because I have said the above argument many times. It’s mind boggling to me that Quebec is behind the other provinces in terms of prosperity. We have all the ingredients to be successful. We have the solution to our problems and we hold the key to our success. The people of Quebec to raise up and live up to its potential. Unlike Canada, Quebec is coherent: geographically, historically and culturally. 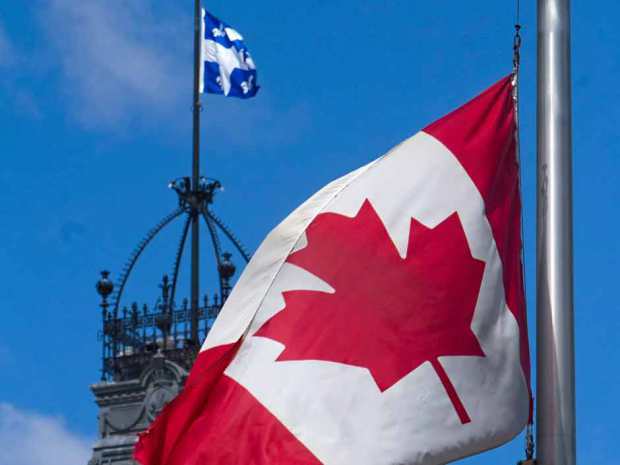 Although many in English Canada deride Quebec for its dependence on Canada — the equalization payments it receives, its proposal to keep the Canadian dollar following independence — in truth Canada needs Quebec far more than Quebec needs Canada. Imagine that Quebec voted for independence in a referendum that all agreed was clearly decided. The Canadian dollar would fall, investments would be put on hold, and chaos and confusion would immediately reign. But this immediate fallout would be as nothing once the long- term implications sunk in. The post-referendum negotiations that would ensue would not be limited to the terms of Quebec’s departure from Canada — all the regions and provinces of Canada would examine their own role in the Canada that remained, and jockey for advantage. In the century and a half since Confederation, the provinces have never agreed to so much as free trade among themselves. The odds are slim that they would each put aside their long-standing grievances to happily come together in a lasting new partnership. Take Newfoundland, which joined Canada only in 1949 and then only narrowly, after two bitter referenda, and on the expectation of being on the receiving end of pensions, family allowances and other federal government benefits. Newfoundland— like Quebec a distinct society and every bit a nation — is today a have province that subsidizes the rest of Canada. If Quebec leaves Canada, Newfoundlanders would almost surely agitate for a referendum of their own to revisit their decision to join Canada. Also like Quebec, Newfoundland’s is an export economy that sells mainly to the U.S. — trade with Canada’s other provinces takes a back seat in importance. Albertans, who write by far the biggest equalization cheques to other Canadians, would also balk at signing on to a renewed Confederation that resembles the status quo — too many remember how the rest of Canada plundered them through the National Energy Program in the 1980s, and too many now resent the way they are being demonized for their tar sands. At a minimum, Albertans would want a new deal that didn’t make them subject to extortion from the very people they were supporting; more likely, they would question the prudence of joining a new untested union of uncertain future when, as an oil and gas exporting economy whose earnings come in U.S. dollars, their future on their own would be far more predictable. British Columbia, too, that paradise on the Pacific, rich in natural resources, perfectly positioned to capitalize on the fast-growing Asian trade and closer in temperament to Washington State to the south than to Alberta to the east, could also pause at the prospect of re-Confederating. A wild card in all this would be the U.S. In 1948, despite opposition from both Canada and the U.K., numerous members of Congress were open to Newfoundland joining the U.S. — with 100,000 American servicemen stationed on U.S. military bases in Newfoundland during World War II, the two had become close. Today, the U.S. would be leery of accepting a Canadian province into the union, for fear of upsetting the Republican-Democratic balance in Congress, but the U.S. could decide to make a simultaneous play for right-wing Alberta and left-wing BC — this was the formula that was acceptable to Republicans and Democrats in 1959, when Alaska (then Democrat leaning) and Hawaii (then Republican) joined the union. The spectre of upheavals, even when viewed as a distant possibility, suffices to scare Canadian governments whenever Quebec separation becomes remotely plausible — they don’t want to come anywhere near these scenarios. For this reason, Canadian governments have consistently, preemptively made concessions to Quebec, to stave off any serious discussion of its leaving. Trudeau himself anticipated these concessions would be necessary. “The reason we have a united country, the reason why it will stay united, is because the Canadian people everywhere are prepared to pay the price of that in money terms, in tax terms,” he stated in 1968. Yet money from the rest of Canada may not be enough at some point in the future— when Quebec itself becomes a have province, as Newfoundland and Saskatchewan did in the last decade. Quebec has all the ingredients needed to be a prosperous country: a talented workforce, top-ranked universities, advanced industries, abundant natural resources — everything but the good governance required to bring it to Swiss or Swedish levels of economic competence. One day it will acquire that governance and assert its desire for independence. The end game for Canada at that point, ironically, could be precisely the kind of EU-style sovereignty-association that Quebec has been arguing for. The alternative — the prospect of a breakup of Canada, with all the unknowns that would engender — would be sufficient to make us all grateful to keep Quebec in the fold, however loosely. Last year the league broke the $3 billion line for the first time. 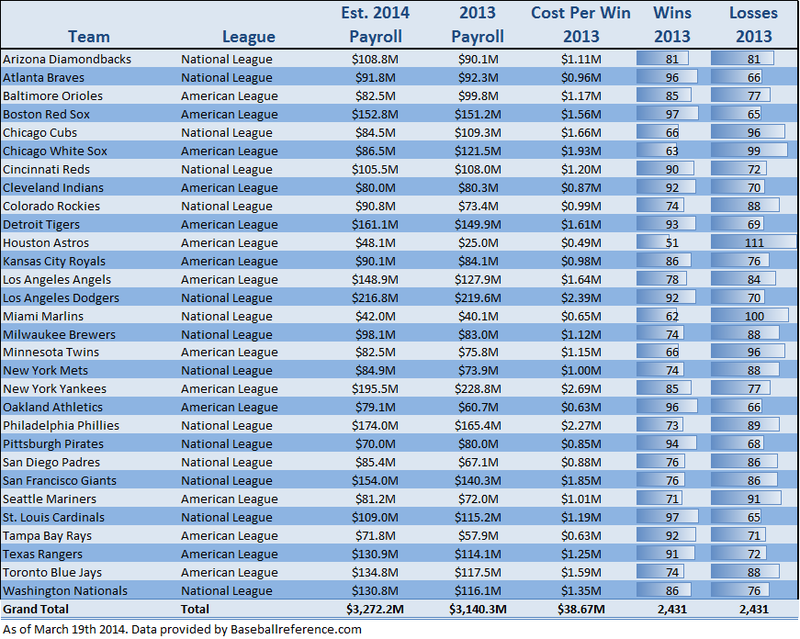 No surprise here, the estimated 2014 league payroll is up approximately 4%. For the 2nd year in a row, the LA Dodgers lead the league with the highest payroll with $216 million (slightly down from last year). This year the Miami Marlins have the lowest payroll with $42 million. They took the title away from the Houston Astros who almost doubled their payroll this year, exploding from $25 million a year to a shocking $48 million. Regarding teams with a winning record, the Oakland A’s and the Tampa Rays are the teams that are able to scrap together the cheapest win (cost per win). Great video. I can relate somewhat since I did live in a world without Internet. I think the only difference was the increase in video games in my youth but it hasn’t reached epidemic level. Slow dial up was rolled-up in my mid-teen. Looks like he didn’t predict his predictions floating around on the Internet. 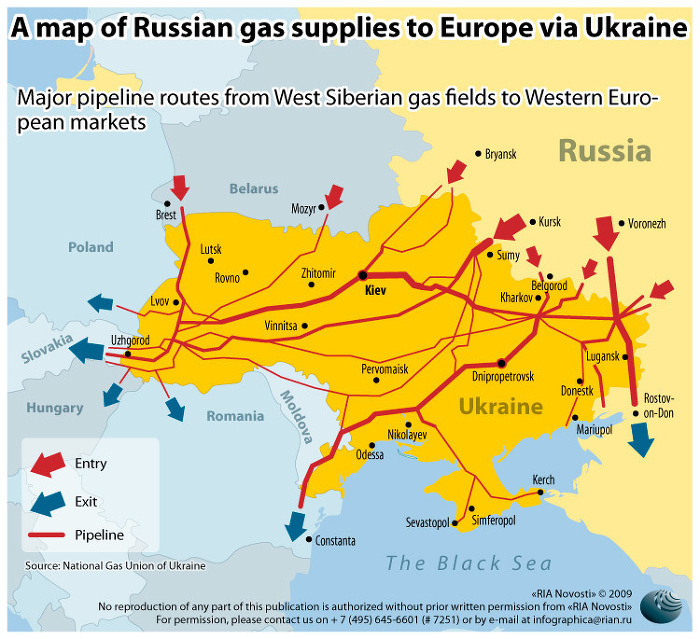 Surprisingly (actually not) overlooked and given less attention is the vast existence of gas pipelines linking Europe to Russia. This is the financial news that dominated the headlines for a while. The question in everybody’s mind was “Did Facebook overpaid for WhatsApp”? What’s next is an elaborated version of my response on a LinkedIn thread. Being a “valuation” guy, these kinds of deals makes your head shake. It also shakes the core of valuation principles. It looks like I had it all wrong. I should scrap everything I learned and stick to this new principle: The less revenue you have, the higher your valuation. Is the Facebook/WhatsApp deal over valued? If you rely on the ”standard” financial metrics that would be a yes. But since the numbers are off the chart it’s the reason we are talking about it. There’s probably a strategic side that I can’t value. (like eliminating a competitor, banking on growth, database mine gold…) After having some time to digest the news, I still think it makes no sense. However, the transaction makes Netflix and Tesla looked like deep value bargain stocks. The transaction brings be back to the dot.com era, when ”this time it’s different”. New start-ups with no revenues were valued using the number of eyeballs hit your page got. Very little focus was on how to monetize the number of eyeballs metric. In the end the result was disastrous and a lot of people lost their savings. Today, particularly in the social media segment, I see a lot of the same ”this time it’s different” mentality, the favorite song of the market herd. It’s also a very dangerous tune often signaling an overbought stock or a market peak. This type of apps can take off really fast. Just check Telegram, they are signing millions of users every day and the interface is almost identical to WhatsApp. For $19 billion you don’t get much barrier to entry. Anybody with some programming skill and the right backers/push can launch the “next big thing”. I’m sure the Telegram backers are waiting by the phone for a Google type company to call before the party is over. Facebook actually tried to create their own WhatsApp clone with an app called Facebook Messenger. It was believed that FB could capitalize on their large user base but that failed miserably. In the end, I’m not sure how Facebook will make their money back for something that is likely to going to be free. The best line I have seen so far explaining the situation: ”Facebook spends $19 billion for WhatsApp. Looks like Facebook is trying to be….well the next Facebook.” I’m sure Zuckerberg will find a lot of hidden synergies between the twenty WhatsApp employees and the thousands at Facebook. ($1 billion per employee). This will end up being the biggest and fastest write-off of goodwill in human history. This is a big game of bluffing and politics. I don’t think there will be a war (unless some drunken Russian soldiers accidentally hit the trigger on the AK47). If there’s a war, it will be a civil war. To date I have listen to Western media and Russian media and the difference in coverage between the two is the equivalent to the difference between black and white. The views are heavily slanted and biased based on the reporter’s motives and background. In the Western media, Russia is an aggressor is illegally occupying Crimea. In the Russian media, Crimea is protected by Russian Peacekeepers because it’s Russia’s moral duty. It’s hard to have the “full picture” coverage of the event. So far the media seems to be covering the day to day events without filling the big picture. They don’t really dig beyond the surface to understand the sources and motives behind the conflicts. I think the real war is economically. 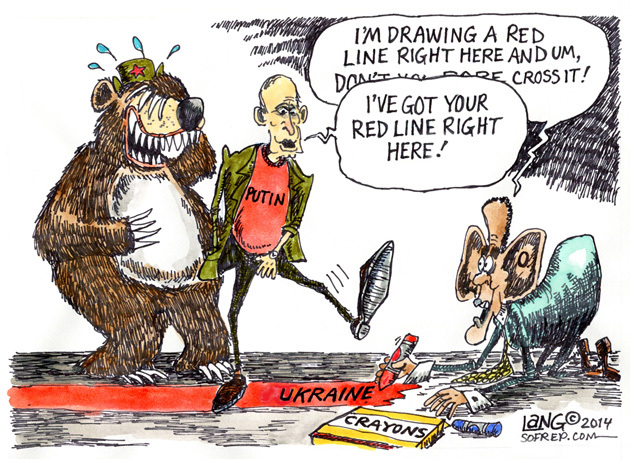 Russia could use Gazprom has a weapon. The Russian state owns a controlling 50% stake in Gazprom, the largest natural gas company in the world. Gazprom is an important source of revenue for the Russian government. Ukraine and parts of Europe relies on Gazprom for most of its energy. Without Gazprom Ukraine would not be able to heat their homes and fuel their industries. The Ukraine-Russia dispute could affect gas supplies to Europe as it did in 2006. It might also be in Putin’s interest to control a very strategic warm-water port. And finally, Ukraine would not be eligible to join NATO because the charter prohibits new members from having territorial conflicts. Russia certainly doesn’t want a NATO country in their backyard. Crimea is very important to Ukraine and Russia. It’s located on the warm Black Seas and is an important source of tourist income for the Ukraine government. Crimea is also a hot source of future energy. The conflict is threatening Exxon Mobil and other companies’ prospects for oil and gas drilling in the Black Sea. It also derails Ukraine’s wish to detach themselves from Russian gas imports. The media has labeled the conflict to simply Russian spoken people vs non-Russian spoken people. But beyond language, there’s a lot of money at stakes and that’s where the real game is played. Valener (OTC:VNRCF) (VNR) is a public investment vehicle that holds an economic interest of 29% in Gaz Métro LP and a 24.5% interest in the Seigneurie de Beaupré wind farm power project. Valener is an energy holding with activities in energy production, energy distribution, transportation of natural gas, energy services, and storage & others. Valener’s growth strategy is directly linked to Gaz Métro’s strategic plan and the Seigneurie de Beaupré wind power projects. Valener also has independent access to growth opportunities as long as it doesn’t directly compete with Gaz Métro’s activities. To help better understand this investment opportunity, financial information of both Valener and Gaz Métro are presented. This is an opportunity for the conservative fixed-income investor that is starving for yield in this never-ending low interest world. If you fit in that category, Valener offers a low-risk solution to your yield problem. VNR offers stable and predictable cash flows, an attractive ~6.4% dividend yield, a solid portfolio of investments, and a strong financial position. VNR brings an element of stability, so don’t expect the value of your investment to jump up and down because the 52-week low/high is $15.17 and $16.44. By investing in VNR you not only lock in a fat dividend, you can also participate in any future potential growth. VNR’s cash flow is secure since Gaz Métro has an absolute monopoly in the distribution of natural gas in Quebec and Vermont. Through its affiliates, Gaz Métro also distributes 70% of Vermont’s electricity. Another element that secures its future cash flow is its 340 MW interest in the Seigneurie Wind Farms that recently just got online. The wind projects are locked into a 20-year contract with the Quebec government (Hydro-Quebec), further securing the cash flow. 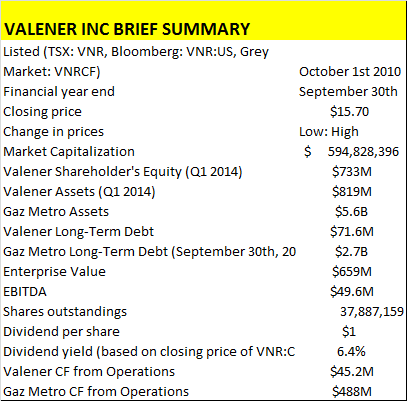 Valener is not a homerun or a multi-bagger type investment. This is a reliable regulated stable utility company. This is an income play with a slight potential in capital appreciation over the long run without taking unnecessary risks. As a perk, this investment also responds to environment conscious investors because of Valener’s strong presence in renewable energies. Based on my valuation, the value of Valener is in the range of $16.71 and $20.00 per share. The $20 is the less likely scenario since it’s the minimum price I would see in a takeover scenario. In the short term, there’s reasonable potential for a 6.7% in capital appreciation and this can add up to 12% if you add the dividend. Valener’s low profile, small size, and indistinct structure might contribute to its shares trading below book value. For the complete article you must be redirected to Seeking Alpha here.